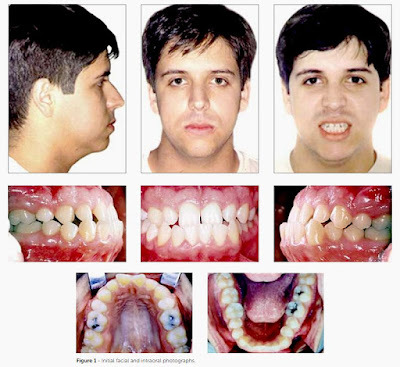 This case report describes the orthodontic treatment of an adult patient with skeletal Class III malocclusion and anterior crossbite. A short cranial base led to difficulties in establishing a cephalometric diagnosis. The patient's main complaint comprised esthetics of his smile and difficulties in mastication. The patient did not have the maxillary first premolars and refused orthognathic surgery. Therefore, the treatment chosen was orthodontic camouflage and extraction of mandibular first premolars. For maxillary retraction, the vertical dimension was temporarily increased to avoid obstacles to orthodontic movement. At the end of the treatment, ideal overjet and overbite were achieved. Examination eight years after orthodontic treatment revealed adequate clinical stability. This case report was submitted to the Brazilian Board of Orthodontics and Facial Orthopedics (BBO) as part of the requirements to become a BBO diplomate.